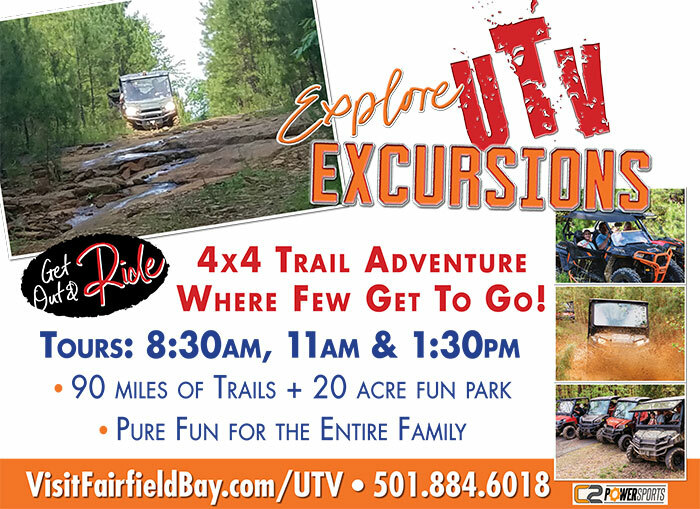 Calling all ATV/UTV Riders! Are you looking for a place that has challenging trails, beautiful scenery, and is fun for the whole family? Look no further than Fairfield Bay. 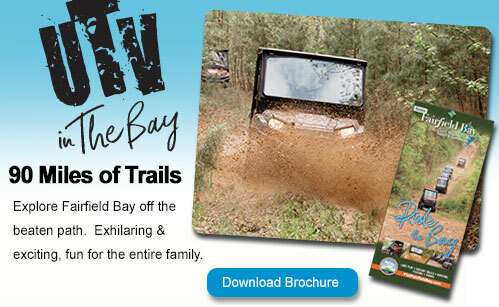 With over 90 miles of trails, we are the ultimate destination for your ATV weekend. From trails with skill levels ranging from easy to advanced, you’re sure to find the trail that is just right for you. As you fly through the woods, you can’t help but feel the rush of adrenaline as you traverse stream beds, rocks, and woods. You’ll feel like you’re way out in the woods, when you may be only yards from a paved road. With excellent signage and both digital and printed maps, you’ll be exploring Fairfield Bay like you never have before. 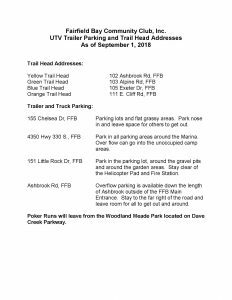 View Trail Parking details below. 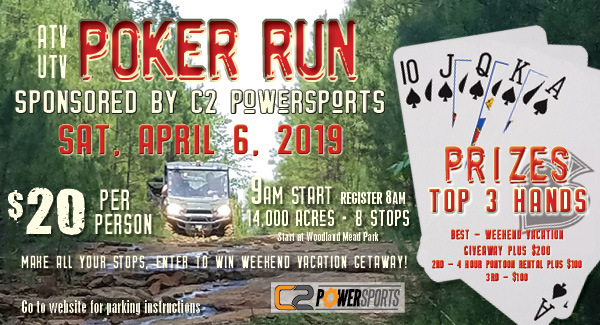 Join us for our 3rd Annual ATV UTV Poker Run. Make all of your stops and enter to win a weekend vacation getaway! Many locations have been designated for parking trucks with trailers. It is important to know where you can park and that you park correctly. Nose in your vehicle whenever possible to maximize the number of people that can park. Please do not park in church parking lots or a business’s parking lot. Maps are located at Jack’s Convenience Store and the Woodland Mead Park hanging on the sign labeled “Trail Maps”, as well as on this page for download. 1. At Woodland Mead Park on Dave Creek Parkway. Both by the pavilion and the basketball courts. Nose in to leave room for others. 2. Across from the main entrance on Highway 16 on Ashbrook Rd. This is a wide gravel road with little traffic. Park only on the right side of the road in single file. 3. At the intersection of Persimmon Rd. and Garden Lane near the gardens and Helicopter pad. Park behind the gardens and Heli pad. 4. On Haverhill Rd. at the Utility Department’s gravel pit. Park to the far left of the lot and nose in. 5. At the Cool Pool Parking lots located on Chelsea Dr. In addition, the 2 flat pads located to the left of the Cool Pool Parking lots are available. Please nose in toward the Condos. 6. Parking at the Fairfield Bay Marina at the Marina or along the side of the road. Also at the Razorback Rock Parking lot at the entrance to the Marina. 7. At all Trail Heads along the dirt roads. Park on the sides of the roads and do not block it for other traffic. Northwood Hills – Trail head is at the Fairfield Bay main entrance. Mountain Ranch – Trail head is at Maddox Dr. & Alpine Rd.